"A Hawaii delegation, including Sen. Daniel K. Inouye and Gov. Linda Lingle, were among the invited guests at the christening ceremonies. Lingle is the submarine's sponsor. "Most people, when they hear the word Hawaii, they immediately conjure up pictures of beautiful beaches, lovely dancers and moonlit nights," said Inouye, a decorated World War II veteran. "Hawaii is all that and more: Our sons and daughters have participated in every war since we became part of the United States." "The 377-foot-long Hawaii joins the USS Virginia and USS Texas in the new line of Virginia Class submarines. 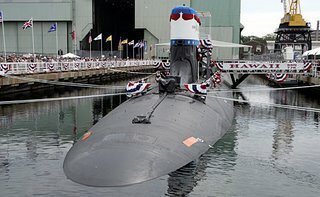 The sub, built jointly by Electric Boat in Groton and Northrop Grumman Newport News in Virginia, will carry a crew of 132 officers and men. It is expected to be delivered to the Navy early next year. The Navy has not announced the location of the sub's home port. "The submarine received a traditional Hawaiian blessing by guest Raymond Ganoti, of Oahu. Ganoti chanted and prayed in Hawaiian and English as he anointed the submarine's hull with a ti leaf. After the blessing, Lingle broke the ceremonial champagne bottle across the sub's hull." I what I think might be a first, EB did a webcast of the ceremony -- it's supposed to be available to view for the next week at this link. I'll have to check it out when I get a chance. Update 2114 17 Jun: The Sub Report has quite a few more pictures from the ceremony. In general, how would you folks rate the VA class vs the LA class, even the late model LA class.